No Places Available at this time. Welcome to Andrea's Childminding, A HOME FROM HOME SETTING. Graded OUTSTANDING in all 4 AREA's by OFSTED Dec2018 . 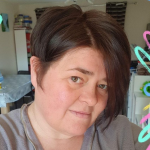 MY name is Andrea I have more than 12 years experience, Myself and my husband both have a NVQ lvl 3 in child care, we have 2 children of our own ages 16 and 12. We are friendly and treat any child in our care like our own and as part of the family, We like to go out in a morning to play groups, play gyms, parks, drop in centre's, for lovely woodland walks or shopping, plus outings to the following all included in my fees ,Sealife centre, Museum's, and trips to the farm . Lots of free play, books to explore, colouring or sticking to do and loads of toys to choose from. I also have a large garden area for out door play with slides, a play house ,scooters , bikes, sand table ,water table, also to be found in our lovely garden, we have a variety of fruit bushes and we grow herbs which we teach the children all about. Also we have a loving little dog called Pudsey who loves children + 1 Rabbit called Vanilla. I have been working as a child minder now for over 14years and love the variety of my Job. I have had the honour of looking after children from 2 months old and upward. Graded OUTSTANDING by OFSTED Dec 2018 in all areas. Please message me with your choice of days, times and the start date you require and I will get back to you the same day. You are welcome to get in touch to come for a visit. FREE 2/3/4 year old funded places available. ( subject to the government guidelines ). Please feel free to message me with any queries or questions. For extra hours along side the Free 2/3/4 year old places please ask. £40 per day Term time only ( 39wks) *no charge for school holidays. Breakfast, Lunch, snacks, snack tea, drinks and outings are included in my fees. I can also accept work place childcare vouchers & the tax free Government childcare vouchers. Please contact me with any questions, or to come and have a look around any time. Below are the latest reviews for Andrea k. Please note that reviews represent the subjective opinions of other Childcare.co.uk users and not of Childcare.co.uk. Parents must carry out their own checks and references on childcare providers to ensure that they are completely happy before enaging in the use of their services. Though my little one was only with andi for 2 days she felt 100% comfortable with them. She was stimulated aswell as look after and had 2 amazing fun days out (which were included in the price) Andi and her husband also went of their way to be helpful and put myself and partners mind at rest would 100% recommend. We have used Andrea and Hakan as our childminders since Andrea first started eight and half years ago. We wouldn't use anyone else, they are a welcoming and friendly family and provide excellent care, give lots of love and attention. The children enjoy fun days out from trips to the park, play groups, soft play and even the zoo. Andrea provides a well balanced diet and encourages children to try new things with great success. Their flexible approach to meet your individual requirements set them above other childminders. I cannot recommend them highly enough. Hi i had andie has my childminder over the past three years through my nurse training to look after my two sons. Both of my sons really enjoyed going to andies house over the past three years. She has been very flexible within the hours I have needed her for especially with my very early shifts. I would recommend Andie 100% for full time childcare.